There is no such thing as too much monitor…although I think I’ve come close this time. 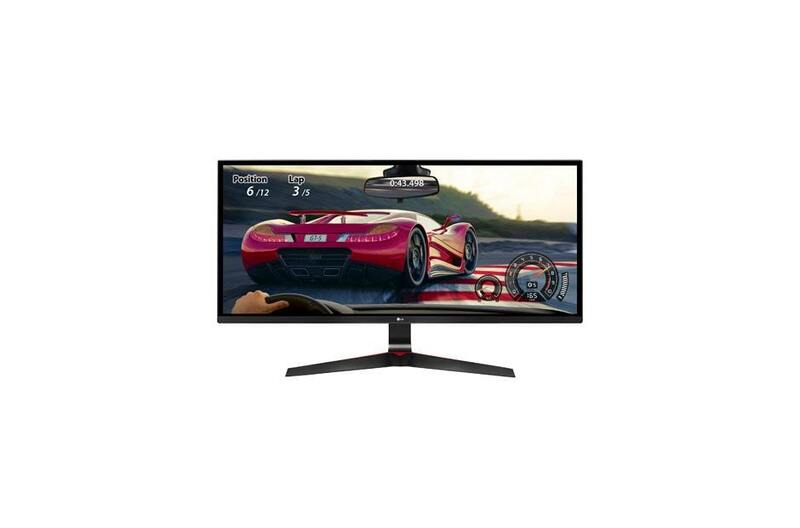 I bought an LG 34UM69G 34″ ultra-wide monitor for the office from amazon for $215 on Cyber Monday. It has 2560×1080 resolution and is indeed very very wide (21:9 aspect ratio). It’s taking the place of another high-def (QHD) monitor with a more traditional aspect ratio. When I first saw the box, I worried that it might not fit on my fairly large desk, but I was pleasantly surprised; the ultra-wide monitor fits nicely and looks great. The panel itself had no dead pixels and is very thin with almost no bezel so it looks and feels smaller than the 28″ monitor it is replacing. The base is elegantly designed, feels solid, installs with no tools, and has good adjustments for height and tilt. The internal speakers are good enough that I’ll get the external speakers off my desk; the width helps with the stereo effect. The full resolution is obtained using the included (but somewhat short) HDMI 1.4 cable and it even works with my ancient Zotac GeForce 210 video card (something that needs to be upgraded soon). Overall, this monitor is a winner and provides a lot of screen real estate without making the text so small that my over-50 eyes have trouble. I don’t think I’d want anything wider or higher resolution (as that would cause text to become too small). Recommended! It’s been a year and a half since I last posted on this and some new tools are available; they work great with STM32L1xx, STM32F1xx, STM32L4xx, etc. There are many pre-built configuration files in the interface and target sub-directories wherever you installed openocd. If your interface or target aren’t supported, the configuration files are text and can be easily edited to support your needs. Eclipse CDT (especially the standalone version) integrates nicely with gdb and OpenOCD and provides a friendly, smart, graphical source-level debugger. From there you can step into/over lines of source code, browse variables and C and assembler source code, view/set/clear breakpoints graphically, and do everything you would expect from a modern debugger. For a long time, I resisted the urge to buy a smartwatch. Most of them look like you’ve strapped a cellphone to your wrist, they need to be recharged nightly, they require a button press or a wrist flick just to see the time, many aren’t waterproof, and most of the features aren’t appealing to me due to the small screen. I tried wearing a fitness band and a regular watch, but wearing two things bugged me. To the rescue comes the Withings Steel HR, a hybrid of an analog watch, a smart watch, and a fitness band in a nice looking package that is slightly smaller than my old watch. I’ve been wearing it for several weeks now and I really l ike it. 3 week battery life for smart features, longer for watch and steps. OLED display covers the rest with a single button: date, steps, miles, calories, etc. OLED and gentle vibration also alert you to incoming calls (displays caller) and text messages (displays from whom) and calendar events (displays event title), allowing you to decide whether you need to fish your phone out of your pocket. Note: my eyes and I are over 50 so I was concerned about the size of the text on the small OLED display, but it turned out to be OK. The watch comes in two sizes, I prefer the smaller (36mm) variant; it includes a black silicone band that is very comfortable and secure, but I am used to a stainless band; fortunately, this watch takes any standard 18mm band so I bought a nice looking replacement on eBay for $10 and it fit perfectly. It’s not yet officially available in the US, but it will be soon, you can read more about it here. 10/24/2017 – A new contender is the Amazfit BiP or the snazzier Amazfit Pace. The BiP has very long battery life (45 days) and the Pace has much less (~5 days) but looks better, both are waterproof, have fitness monitor, GPS, smarter watch features, low price, and always on display. The only down-sides I can see are appearance/size: both are large and considerably less attractive than the Steel HR (the Pace looks better, but the battery life is too short). You can see a video review of the BiP here. When they make one that looks like the Pace but has the battery life of the BiP, I’ll buy one. Owon USB scopes are great and I carry one in my robotics bag, but they aren’t ideal for field use because they take too much time and space to setup (laptop, wires, …). 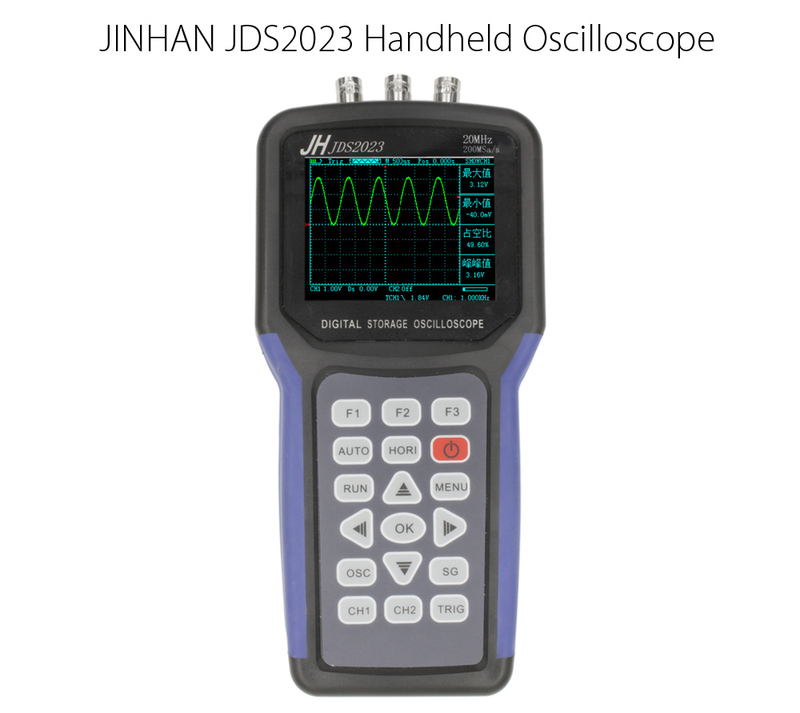 So I purchased a the low-cost JinHan handheld oscilloscope and so far, I’ve been pleasantly surprised. 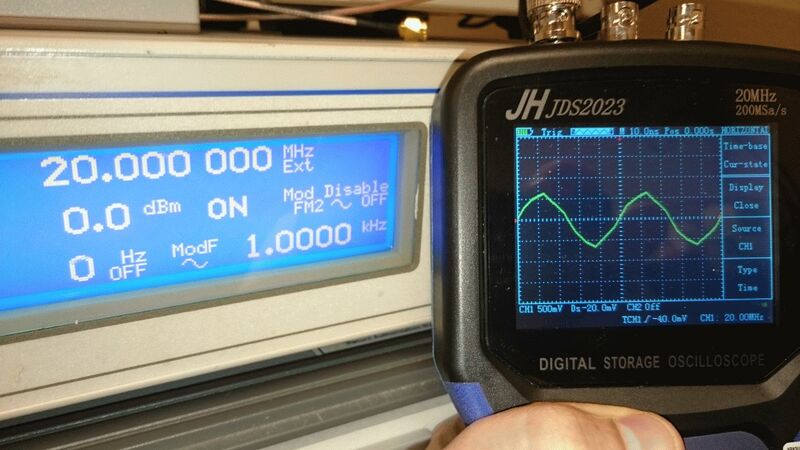 I bought the JDS2023 on AliExpress for $113 shipped via DHL (quickly); it integrates a 200MS/s dual channel 20MHz digital o’scope with a 5MHz signal generator in a remarkably small, light package. It has a bright, readable 3.2″ LCD color display and a reasonably intuitive UI (I never needed the manual) although the addition of even a single knob would make the UI better. It offers all the basic scope functions including automatic frequency and p-p amplitude measurements. The Auto button does its job well. EEVBlog does a teardown of the JDS2012a. The user manual is here. The scope comes well packaged and includes a single 6100 (ostensibly 100MHz) scope probe, BNC to alligator-clips cable for the signal generator, USB cable, and separate battery charger. It does not include the required 18650 lithium battery (probably due to air shipping restrictions) or a carrying case…but what do you expect for $113? Power over the USB cable will run the scope. I haven’t seen anything close to this level of functionality at this price. If I need more, I’ll probably step up to the Owon HDS1021M-N or UNI-T UTD1025CL, but they are twice the price, considerably larger, and sans signal generator. 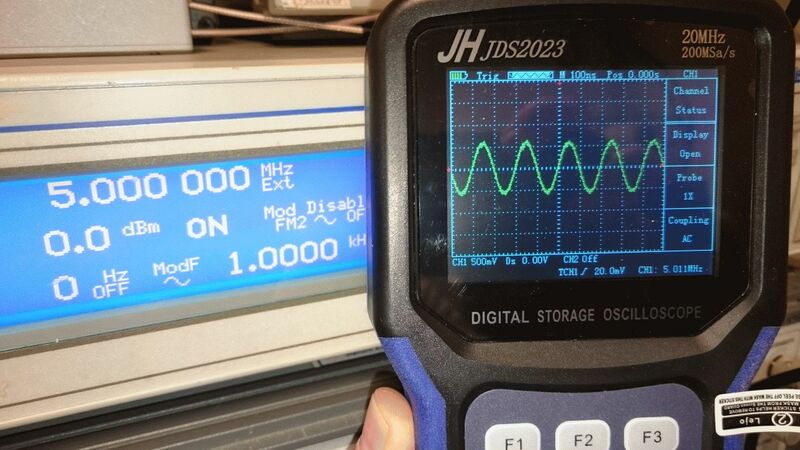 I tested it quickly using a lab-grade RF signal generator and confirmed the 20MHz bandwidth specification; it clearly shows at least 10 points per cycle of the sinewave (validating the 200MS/s specification) and there is no amplitude compression of the 0dBm signal (nominally 0.632vpp into a 50-ohm load – this is unloaded so it correctly shows 2x vpp); the analog front end 3dB compression point is somewhere north of 40MHz. I finally caved and bought a 3D printer: the Cube 3 from 3D Systems and so far I’m pretty happy with it. See the manual here. The hardware is high quality, it’s easy to use, has dual-extruder jets, and looks pretty sharp. In some ways it is like an Apple product: a beautiful, but closed eco-system: the main down-sides are that it uses proprietary software and requires proprietary filament cartridges which cost more andsee update below are limited to PLA and ABS (the most popular material choices); other “cons” are that it isn’t fully enclosed and it doesn’t have a heated base which diminishes its performance with ABS and seems odd for a printer at the $1K price point. I’m a beginner at 3D printing and I’d read about folks spending a lot of time getting their printers working in the first place and then keeping them working including constant parts replacements. 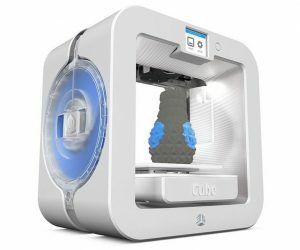 The Cube 3 reviews indicate it is good for beginners and I want to focus on learning 3D mechanical design and printing instead of fighting with the tools. The Cube 3 has been discontinued and is available at fire-sale prices under $200 shipped on eBay including two cartridges. That’s an amazing price for a well-made printer and unheard of for one with dual-extruders. At that price, it’s a no-brainer: if I start doing enough 3D printing for the cost of filament to become an issue, I’ll buy another printer and have gotten my money’s worth. I’ve printed many objects in PLA which have come out nicely. PLA seems to be the go-to material for 3D printing; it is very strong but brittle, has good dimensional stability while printing (doesn’t shrink much as it cools), and has no smell when you print. I’ve also printed a couple of objects in ABS and they came out nicely although there was some mild warping at the base (because the platform is not heated). I printed a thin sheet of ABS too and it is remarkably flexible. There is a slight smell of melting plastic with ABS, but in my basement (big space) it was barely noticeable and certainly not a problem. Overall, I’m very happy with the purchase and am enjoying 3D printing. Adjust the printer ‘z’ gap (the distance between the platform and the print nozzle) periodically. You do this from the front panel using a provided feeler strip; it doesn’t take long. You should adjust the gap until the feeler just barely slides beneath both nozzles with some friction between the platform and the lower nozzle. Having the gap a smidge too wide is better than too tight. If you are experiencing failure of filament to flow/jammed nozzles, the Z-gap being too small is almost certainly the problem. Don’t be afraid to repair the cartridges. See how to do it here. The top cover snaps off; it takes a lot of force, but the cover doesn’t break; 3D Systems advises this in their Advanced Cartridge Reset Guide. Inside is a spool of filament with a clever latch to keep it from un-spooling when not mounted in the printer and a simple but effective feed mechanism. Filament passes between two gears that grip the sides and push it forward or backward. You can manually advance/withdraw the filament if it is broken using a Robertson (square) or Torx T20 screwdriver inserted into the feed mechanism drive (where the printer drives it). Note that you can only do this when the filament is broken (which happens sometimes); otherwise, keep in mind that the end of the filament is melted into the tip of the nozzle and if you try to withdraw it the filament will break and problems will ensue. Don’t be afraid to repair the nozzle. The nozzle is a two-piece snap-together assembly that can easily be opened by inserting a screwdriver in the crack near where the nozzle assembly starts and the feed tube stops and prying forward (away from the feed tube). You can repair a nozzle clogged with PLA by raising the temperature of the nozzle until the PLA softens and the nozzle tip slides off the tube; see here. Be careful not to pull too hard or you’ll break the plastic feed tube. If you have one, a hot air workstation (or perhaps a hairdryer) is a great way to heat the nozzle; if not, you can let it heat up in boiling water. If you do any work with modern electronics, you should have one of these. I set the hot air to 130-140C and heat the metal nozzle until it slides off the PTFE tube; I hold the nozzle with tweezers or needle nose pliers while it heats applying *very* gentle pressure; it should slide off the tube easily. There are firmware hacks that allow you to use non-proprietary filament; this works, but you use it at your own risk: see Cube Toolbox. A video showing how to use it is here if needed. I find the cartridges sufficiently unreliable that I no longer use them as intended; I remove the filament spool and put it on an external spool holder. I leave the cartridge cover off and feed the filament into the bottom of the extruder assembly and I hot-glue the portion of the PTFE sheath that fits into the cartridge edge so that it stays in place even with the cartridge open. Finally, filament absorbs water from the air and becomes brittle and problematic. This is not a problem specific to this printer, it affects all FDM printers. Once opened, filament needs to be stored in a sealed airtight container. To fix old filament, that has already absorbed moisture, I put the filament in a food dehydrator overnight at around 130F. When filament is not being used, I store it in a ziplock bag with a few desiccant packets which I then put in an airtight container such as an ammo box (available at Sams and Costco). For storing more filament, I use a bucket with screw-on cover and silica gel kitty litter for desiccant. If you want to refill a cartridge, there is a filament winder apparatus here with video showing its use here. POWER SUPPLY: The Orange Pi requires a 5V/2A good quality power supply. The power input is a 4mm x 1.7mm DC barrel jack (same as Sony PSP and many other devices). You cannot power it through a microUSB cable like a Raspberry Pi; you have to power it through the 4.0mm x 1.7mm DC power jack. I made the mistake of buying a really cheap after-market power supply meant for the Sony PSP and had lots of trouble because the power supply was too noisy; others have had similar problems. Get a good power supply like this one from LoveRPi or a microUSB to barrel jack adapter if you want to use a good existing micro-USB 5v/2A supply. MICRO-SD CARD: There are a zillion Linux (and Android and other OS) distributions for the Orange Pi, but many of them are hard to install or missing important capabilities. I spent a lot of time sorting through them and ultimately installed ARMbian Linux (Debian Jessie Server) using Rufus onto a Samsung EVO 16GB Class 10 micro-SD card. I plugged in the uSD card, Ethernet, HDMI monitor, USB keyboard, and power, and my Pi was up and running (fast)! There was lots of space left over on the 16GB card; even an 8GB card would leave plenty, but try to avoid slow cards (e.g. don’t use Class 6). ARMbian is a great distribution that is pre-configured for the OPi PC; everything worked out of the box; my network connection came right up using DHCP and I could ssh into the OPi. USER INTERFACE: The intended user interface is an HDMI monitor and a USB keyboard (and mouse if you are installing the desktop/GUI version). If you are technically inclined, the other thing that’s very useful is a USB-to-TTL-serial cable so you can access the serial console. 115200bps, 8, N, 1, Pin 1 on the 3-pin header is ground. Accessing the serial console lets you see what’s happening very early in the boot process; when booting is complete, you can login there as well. A tiny USB serial console is a lot smaller to carry in your laptop bag than a monitor and keyboard. OTHER USEFUL TOOLS: You may also find SDFormatter useful for erasing/reformatting SD cards. COOLING: ARMbian runs the CPU pretty cool; it rarely got more than slightly warm to the touch. However as I was experimenting with different linux distributions, some would get the SoC very hot very quickly. Self-adhesive heat sinks are very inexpensive and probably worth adding, at least one on the H3 SoC. CONNECTING TO PROJECTS: If you plan to connect your OrangePi to some custom electronics, WiringPi has been ported to the OrangePi and I was able to have it blinking LEDs within a couple of minutes. If you need them, instructions are here and for more info see here. If you follow the steps I mentioned above, you should be up and running quickly. Good luck and have fun! The Raspberry Pi has a powerful processor and GPU making it one of the few low cost embedded platforms suitable for machine vision and video processing. The OpenCV computer vision library is popular for C++ development. JavaCV uses JavaCPP to automatically construct JNI wrappers around the CPP OpenCV classes. The port was done by Samuel Audet and you can read about it here. Good sources of documentation are the OpenCV documentation and the JavaCV wiki. OpenCV 3.1 install instructions are here and here. Configure the Pi to use a default IP on the Ethernet interface that’s on the same subnet as the PC auto-IP subnet (169.254.x.y) – I used 169.254.82.80 (‘R’.’P’); this will let you boot the Pi headless, connect it to the Ethernet port of your PC, and ssh into it with no other hardware. To do this, modify the file /boot/cmdline.txt and add “ip=169.254.82.80” to the end of the single long line. See details here. ST-Link V2 hardware debug interface – you can buy an official ST-Link V2 for $23 from Digikey or elsewhere or purchase a nicer clone on eBay for $3.25. ST evaluation boards such as for the STM32L476 Discovery or STM32F4 Nucleo (with mBed support too!) cost $10-20 and include an ST-Link on board that you can disconnect from the evaluation processor and connect to your target via the SWD connector and by removing the two ST-LINK jumpers. 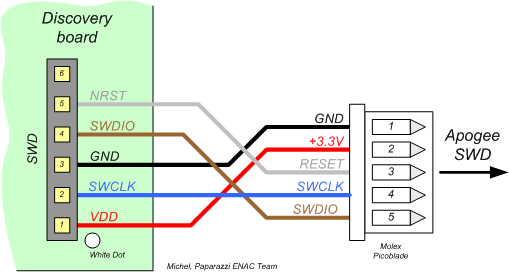 You’ll need to connect the SWD connector to Vcc, Gnd, SWCLK, SWDIO, and NRST on the target. Use the GCC ARM Embedded development tools to build your software. Build an .elf with debug information and a .hex file for programming. For Ubuntu platforms see here for installation via package manager. Many thanks to the STLINK development team. 2016-02-29T16:18:14 INFO src/stlink-common.c: Loading device parameters…. Chip ID is 00000415, Core ID is 2ba01477. I’ve been meaning to learn the Android development environment but was not excited about leaving my beloved NetBeans IDE. Fortunately, there is the NBAndroid plugin that, together with the Android SDK, allows you to easily develop and test Android apps using NetBeans. Next up, go through (and report on) some Android tutorials.